Preface: As you may have noticed, this post is a bit overdue and I will have to admit that I am typing it while sitting comfortably on a train traveling through the suburbs of Philadelphia into Center City. You would have thought that over 24 hours flying would have afforded me enough time to have taken care of this last responsibility, but alas, the movies on board were too enticing and with a bit of busy work for those who know me well. 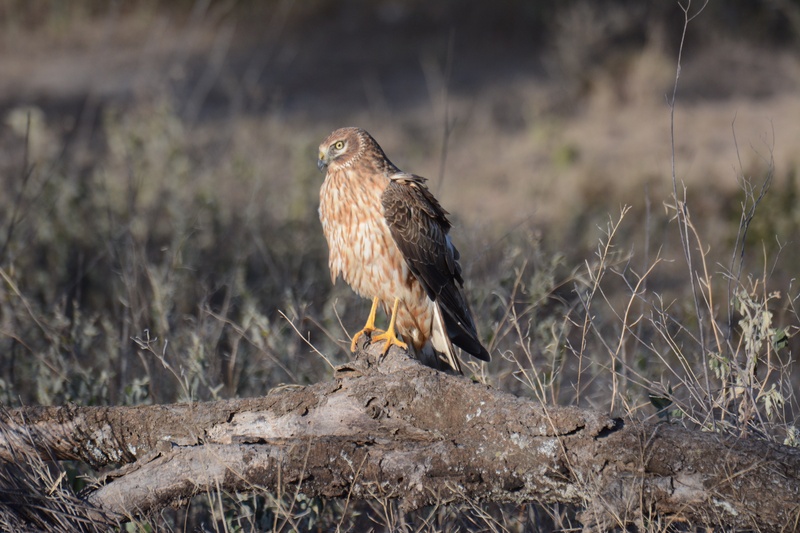 Following our failed attempt at a wonderful Sunday safari in the Crater we were able to completely pack that day which made for an unhurried and more relaxing last morning than usual. Our Land Rover had miraculously been repaired the day before and all we had left to do was load it up with all of our half-packed duffels (not only were we leaving our hearts in East Africa, but also over 150 lbs of medical supplies), say our goodbyes and hit the road. Or so we thought. 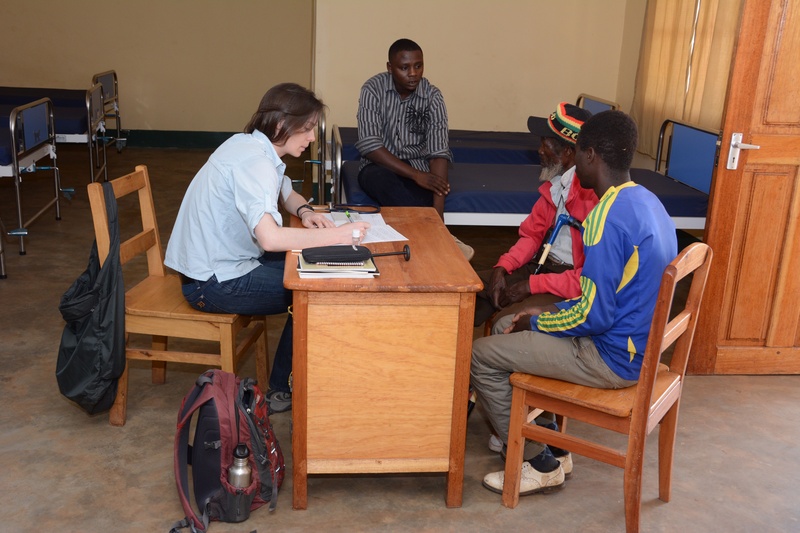 I had scheduled a meeting with Susan, Caroline and William (the FAME brain trust, so to speak, with the noticeable absence of Frank as we had work to do) to discuss the future of the neurology program in Northern Tanzania. It was essentially a debriefing along with setting our short and long term goals for upcoming trips. FAME has grown tremendously over the last several years which requires constant vigilance to maintain focus on their mission and purpose. Christyn and Payal attended the first part to provide their valuable insight following their first visit to this remarkable oasis of healthcare. We had many, many individuals to say goodbye to and thank here at FAME. For me it’s become an easier task since I’ll be back in six months. As I was walking to the meeting earlier, though, Dr. Gabriel had caught me and asked if we wouldn’t mind seeing one last patient in the ward who had come in the day before with some odd story of a very likely neurologic basis. Knowing that once we leave there would be no neurologist in the region until our return it would be very difficult to say no in this situation. Knowing Gabriel as well, and the fact that he is a remarkably competent Tanzanian MD who I’ve worked with closely over the last several years, it was clear that this was very likely to be something in our bailiwick. So with our expected time of departure fast approaching (or had it passed already? ), Christyn offered to start evaluating the patient on the ward while I took care a last minute detail with Will. When I arrived to the bedside a few minutes later, Christyn was surrounded by the team of doctors and nurses and well into her evaluation. 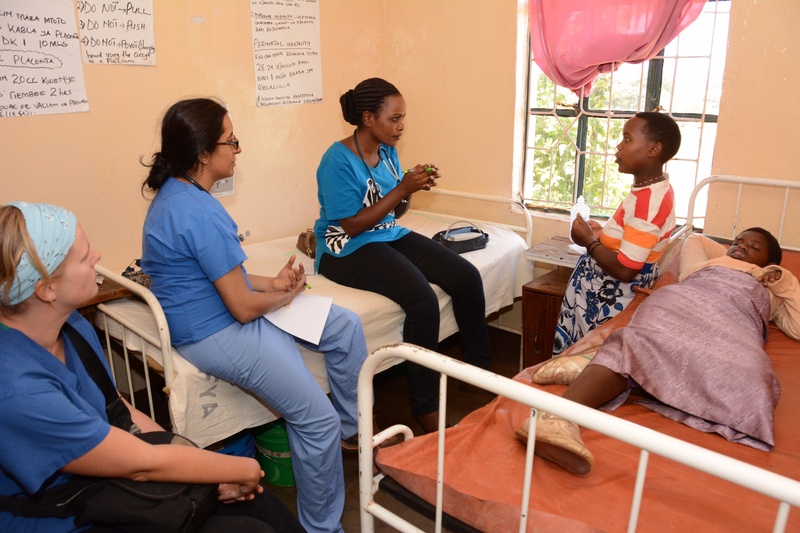 The patient was a 50-year-old Maasai women who was complaining of pain and weakness on one side of her body. She had been seen weeks earlier and sent for a plain x-ray and her working diagnosis was ankylosing spondylitis, an arthritic condition of her spine. It was readily apparent to me on arrival to the bedside and quite clear to Christyn after only a moment that she was far from normal neurologically. Without going into details so as to bore all the non-medical readers and even the non-neurologists, she had a clear problem with misalignment of her eye movements and her exam was grossly abnormal suggesting a problem either in her cervical spinal cord or a bit higher in her brainstem. After brief deliberation, Christyn and I were both convinced it was the latter and she was in need of a CT scan above anything else to make a diagnosis. Problem is, we don’t have one, nor was her family likely to be able to afford one. Such are the inequities that we face every day in Tanzania and at FAME. 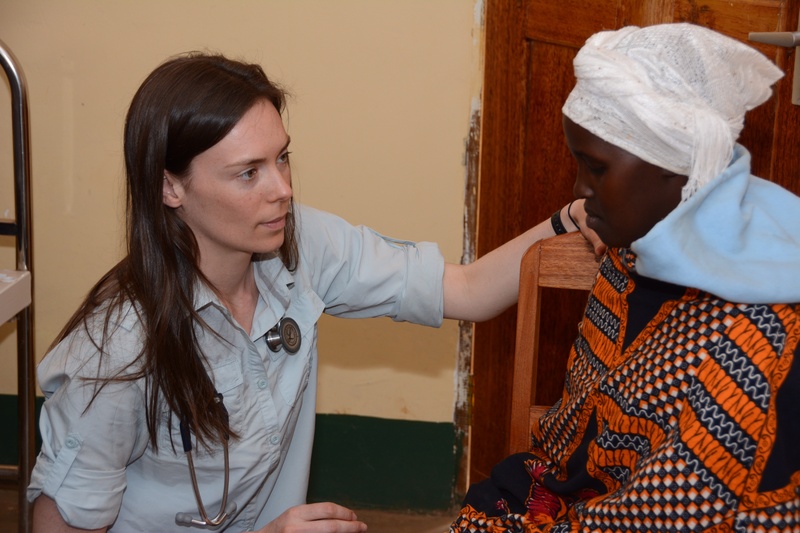 Despite our clinical skills and our ability to bring this to such a remote region of the world, without some access to technology we are ultimately unable to provide the care necessary. The team there wanted to know what they could do to further evaluate the woman and the sad truth is there was nothing else until we had a scan. I don’t have follow up yet, but I’m hopeful that somehow she received the scan and, if it showed anything potentially treatable, that she was sent to the neurosurgeons in Dar es Salaam for treatment. But this was just one patient in a country of 47+ million last count. How do we solve this issue of access to health care and the technology gap? We had planned to hit the road by 10 a.m. and by the time we said goodbye to everyone, stopped in town for a few errands and got cold drinks for the road, it was now noon! The weather was as gorgeous as it had been our entire trip and we made the drive to Arusha through the Great Rift Valley, through the towns of Mto wa Mbu (Mosquito River) and Makuyuni, past the Maasai bomas and to the slopes of Mt. Meru where our adventure had begun three weeks prior. Pendo had lunch waiting for us and we visited with baby Gabrielle before the boys got home from school to play soccer and do our final packing before heading off to the airport. The boys are growing like beanpoles into fine young men and now we get to watch Gabrielle do the same. The KLM flight doesn’t leave until 9:50 p.m., but you have to get to the airport a few hours early given the often chaotic scene there, but tonight it’s very quiet and we get to spend plenty of time in the Tanzanite Club – they have WiFi and the first air conditioning we’ve encountered in country. The drive to the Kilimanjaro International Airport was uneventful, other than the fact that the top of Mt. Kilimanjaro, which is almost always shrouded by the clouds, was perfectly visible to the north. It was majestic with its long vertical snowfields and it was clearly beckoning me with open arms. It was unusual to see it so clearly and there was no doubt that it was an omen for our return trip in October when we are planning to climb to its summit before our time at FAME. That will be another adventure and another trip. For now, we were more than satisfied with the work we had accomplished at FAME. 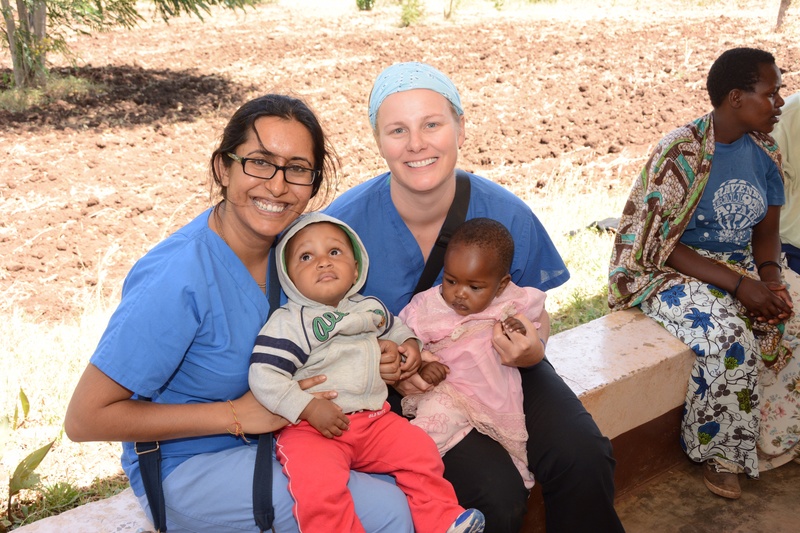 We had seen over 240 patients in the twelve clinic days there and all but perhaps a dozen by Payal and Christyn. The two of them were stellar clinicians and I couldn’t have been more proud of them. They had an experience that they will never forget and saw things they may never see again, but if they do, they will recognize them immediately. Such is the way medical education and the practice of medicine should be. Technology will never replace the history and the physical examination. It will always be the clinician and the patient…. Ngorongoro Crater is one of the highlights of the safari circuit here in Tanzania. Though the Serengeti certainly has more name recognition, and perhaps rightly so due its vast size and diversity along with it being the home of the Great Migration, the crater is an amazingly compact ecosystem and so unique in its topography. A collapsed volcano that is ten miles across at its widest with a rim 2000 feet high, it is perhaps the crown jewel of the parks and is always the most fun for me to drive. It has three roads in – one for descent, one for ascent and one that is both. From a viewpoint looking into the crater you can see the entire park with all it’s roads, lakes and forests. When you are down on the crater floor you feel the vastness of the place and become lost in it’s different regions and forget that it would be like a dot placed on a map of the Serengeti. You drive minutes here and change the scenery, in the Serengeti you drive for hours and still haven’t reached your destination. We all awakened early that day to leave at 6 a.m. as getting to the crater floor will take at least an hour drive having to travel up to the rim on the windy road, half way around the rim to reach the descent road and then the trip down. Joyce, Hannah, Christyn and Payal were accompanying me and we left in the dark to watch a gorgeous sunrise albeit a bit cloudy ascending the Ngorongoro Conservation Area gate. We had paid in advance to go to the crater which means depositing our fees ($200 for the vehicle and $50 per person to visit the floor) into Exim Bank and then traveling to the other side of town to the NCA office with the paperwork so they could then issue me to microchip encoded cards for entry. I had down that on Friday, not wishing to leave anything up to chance. They take no cash at the entrance gate because there had been an issue of it disappearing in the past. With the cards, it was surprisingly easy to gain our entry and leaving the gate behind us we excitedly began our final ascent to the rim. I think I’ve mentioned before that driving in Tanzania can be a challenge at times aside from the fact that the steering wheel is on the wrong side of the car as are the cars on the road. There are few gas stations except for in town and there is no AAA to call and bail you out of trouble should anything occur along the way. I’ve shared a photo in the past of when, a few years ago during a terrible rain, my Land Rover slid off the road into the mud and muck that is the Tanzania clay and buried itself up to its axles. Thankfully, we weren’t far off the tarmac on our way to a mobile clinic and Ema, the main driver at FAME, came to our rescue. It still took three hours to raise each wheel, dig it out, support in with rocks and essentially build a small runway to get us out. We obviously never made it to our scheduled clinic that day. Less than two kilometers in from the gate, while coming around a turn on the bumpy road we suddenly lost forward momentum. No problem I thought, we must have just popped out of gear. I put us back into second while still moving forward and there was s very sick sounding and free spinning noise coming from the gearbox. I could not get any gear, forward or reverse, to engage, but I still had plenty of clutch pedal so I knew the hydraulics were still working. This wasn’t good at all. I rolled the vehicle back several feet to move it off the road and placed a large rock behind the rear tire and there we sat. It was not quite 7 a.m. and the clouds about continued to roll by eventually giving way to bright blue patches followed by another elegant Tanzanian day that we had come to expect despite the fact it was still approaching the rainy season. There may have been no Auto Club to call, and luckily we had cell reception to even consider it, but we called Susan back at FAME and thankfully reached her given the early hour on a Sunday morning. She would call Moshi who would contact Ema (who has rescued me several times in the past) and Suja, the fundi (expert) who works on all of the FAME vehicles along with doing all the metal fabrication for the construction at FAME. We waited an excruciatingly long time to hear something back to confirm that we would indeed be rescued. It wasn’t until almost 9 a.m. that we heard they were on their way and during that time we slept, ate what was supposed to be our picnic lunches for the crater floor, and Hannah, Payal and Christyn played three handed gin rummy. We had practically been the first ones through the gate that morning, but as we sat safari vehicles carrying guests both in and out of the crater cruised by along with work vehicles often loaded with Tanzanians all in varying states of gawkiness as they came around the curve to spy our wounded vehicle. Eventually, Ema and Soja pulled up driving a FAME Land Rover and equipment to tow our vehicle back to town. Soja quickly assessed that our vehicle’s problem was terminal and couldn’t be fixed on the road and that it was very likely the clutch plate. The first piece of business, though, was to get our vehicle turned around without any power and on a very narrow mountain road with other vehicles whizzing by in both directions. Not an easy task as Soja had to back it down a good ways just to find s spot to turn around facing the right direction. He was able to do so and was then on his way rolling down the hill in the proper direction and through the gate. We stopped for a time so I could argue with the officials there about at least getting a credit for our fees, but in the end they stuck to their guns and insisted that it’s a single day fee and we were more than welcome to get another vehicle and go on our way to the crater. By then it was close to 11 a.m. and I think we all felt a bit deflated by the who experience not to mention that we also all felt as though things happen for a reason and going to the crater would be bad karma. We towed the wounded Land Rover back to Karatu (not a small task) and to Soja’s home where they immediately began working on it. Aside from being rescued from the crater, we had to leave the following morning for Arusha and our flight home which meant that we had little wiggle room as far as getting the Rover back on the road. Amazingly, later that evening at about 5:30 p.m. Soja called to tell me he had changed the clutch plate (the teeth on ours were completely stripped) and road tested the vehicle and it was ready to go. The total cost to fix it had been 370,000 TSh, or about $205, which was amazing considering it was Sunday and had to be towed. The parts were over $100 which meant that almost six hours of labor and the tow cost about $100! We spent the afternoon relaxing and both Payal and Christyn finished all of the data collection on the patient charts we had seen, both for our visit in general as well as the new epilepsy project that we received the Linked In grant for. This will be on ongoing project and in October, Danielle Becker and Lindsay Ferraro will be coming to do more work on it. That evening a group of us went out for our last Tanzanian dinner at the Plantation Lodge. I had never been there before, but it is a truly amazing resort that is very different from Gibb’s Farm as it is more open and would look equally at home in Southern California as it does here in Tanzania. We ate outside on the veranda along with only one other couple as it is the low season now, listening to the sounds of Ngorongoro Highlands and watching the stars rise. It is so beautiful here wherever you look and whenever you look. There is just not an unpleasant moment that I can recall – even being stuck on the crater road. Things could have been far worse had we made it to the crater floor and broken down. We might still be there! It is clear that things happen for a reason – my visit to FAME in 2009 was a chance visit that would have never happened if Leonard hadn’t brought me here and Frank hadn’t walked out of his office at that moment. Looking back, it is very clear to me that there is some plan for us all going through life, and had we not had the experiences we do, good or bad, we wouldn’t be who we are today. Each time I awaken I look forward to what the day will bring. As this is my tenth visit to FAME I’ve been able to work out a few of the bugs at least and one of those has essentially leaving enough time at the end to do clean up. Even though we had four patient packed days of clinic at FAME it still seems that there are always those patients who somehow come after we’ve finished those days and started on mobile clinic. This is why I’ve always left at least one or two days for us to see those overflow patients. A number were told to come back and a number just happened to hear that we were there for a few more days. Either way, Friday turned out to be a chaotic day that required all three of us to see patients. 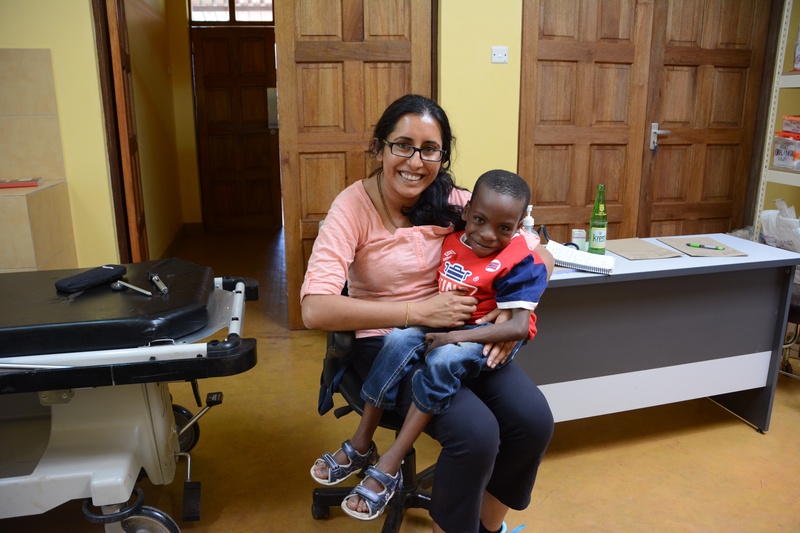 Payal started off seeing a few adults, but later in the morning she was inundated with young patients with various neuromuscular patients brought by a wonderful Norwegian man who has an orphanage in Mto wa Mbu. I had met Stale (pronounced Sta-le with a soft “a”) a year or so ago when he brought three of his children to FAME for me to see. Two were brothers with muscular dystrophy and the third had a more static problem that was most likely due to a polio infection or some other enterovirus 5 years prior. He had also brought with him a young Maasai boy who I had seen in September 2013 when he was admitted to the hospital with what they thought may be polio, but after I’d seen him it was clear that he had muscular dystrophy. Unfortunately, we didn’t have any family history to help us with things and we are also unable to get the most basic blood tests here let alone genetic testing. 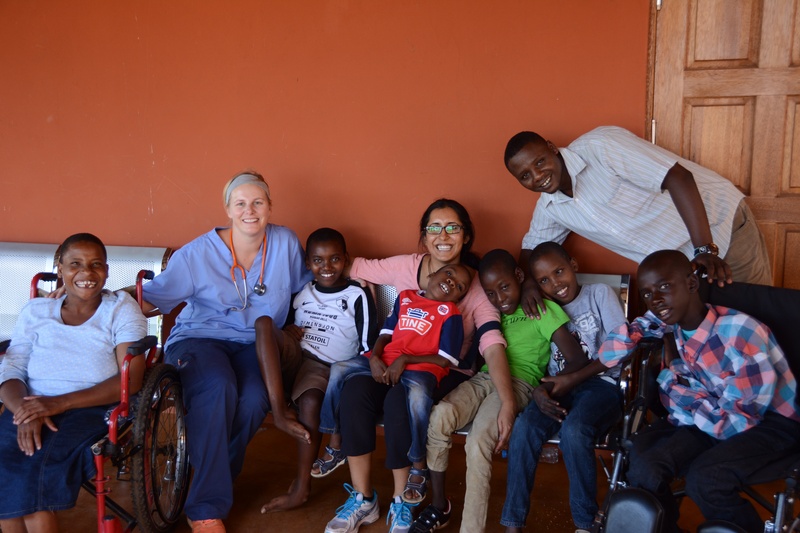 Stale not only cares for the children in the orphanage, but he also helps out many Maasai families in the nearby areas by transporting them for necessary medical care. Everyone who has met him has been totally taken by this selfless man who cares so much for these children. I saw his vehicle pulling up with three little wheelchairs attached to the roof rack of his Land Rover – they almost looked like chariots! In his vehicle were packed ten children all with various neurologic issues, but the bulk of them with neuromuscular disorders. Brothers with muscular dystrophy, the young boy we had diagnosed with polio previously, the young Maasai boy I had diagnosed over a year ago and a new young boy with horrible kyphoscoliosis that we were seeing for the first time. Payal had fully evaluated him and determined that he had mainly atrophy and areflexia with reasonable strength for his given muscle mass. She feared that he had spinal muscular atrophy, a progressive motor neuron disorder. We discussed the case and decided that he was not progressive and most likely had previously had poliomyelitis which meant that he wouldn’t progress. His kyphoscoliosis was so severe, though, that he is very likely to suffer significant pulmonary complications going forward. Recognizing this and practicing some good prevention will likely save him from suffering at least some of these issues. Payal completely bonded with these children as you can see from their group photo taken. These young boys with muscular dystrophy will not have normal life spans, but it is clear that they are very happy where they are currently and for that alone Stale is a true hero. Most of them were abandoned or mistreated by their families – though the young Maasai I diagnosed over a year ago is still with his family and Stale is merely helping them. I had once given him $100 from a generous family back home and he suggested that I give half of it to the mother of the Maasai boy as she could also use help. A hero or a saint? Meanwhile, Christyn dealt with most of the adults that day which included a gentlemen with memory loss at the age of 55 and who had previously been evaluated including a CT scan at KCMC (Kilimanjaro Christian Medical Center) and based on the son’s account was told that there was nothing they could find. We had initially seen him last week and the whole story didn’t make much sense and they hadn’t brought us the scan or any of the records so we had asked them to come back. We took one look at the scan which had lots of little black holes, or small strokes, and knew immediately what the problem was. So had the radiologists at KCMC given the number of small arrows indicating the multiple lesions. It was clear the son hadn’t been satisfied with their explanation and was looking for some miracle, but we had none to offer. We made sure he was taken care of from a stroke standpoint, but that will not reverse the effects of all the strokes he’s had. All in all, we had seen 35 patients that day which was the most we had seen in any one day at FAME and given that it was not a regularly scheduled neurology clinic, that was quite impressive. The following day (Saturday) we had a number of patients early, but things slowed down around lunchtime and we actually were able to leave campus early. 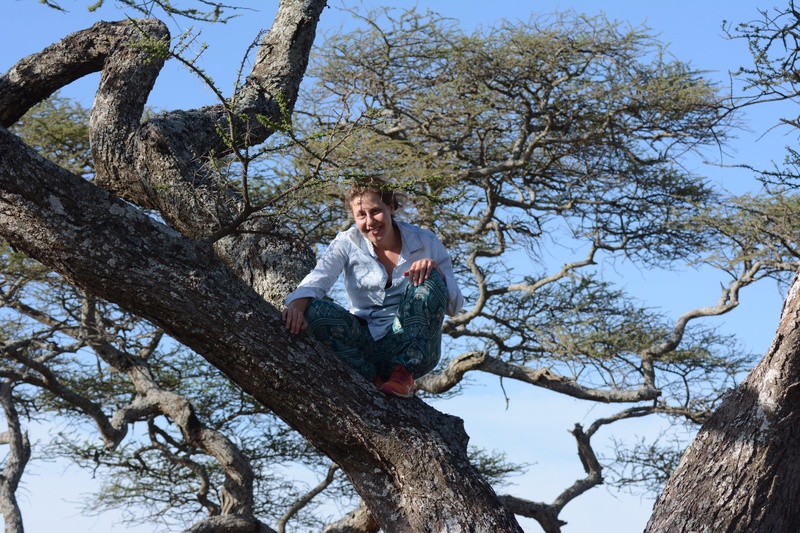 There is a very nice hike that goes above Gibb’s Farm into the Ngorongoro Conservation Area towards the crater rim and to an area called the elephant caves. At this site there is a large amount of iron and other minerals in the ground that the elephants excavate and eat. There are lots of signs of the elephants in this area and they actually come down to Gibb’s Farm and the village of Tloma on a regular basis, usually up to no good such as raiding someone’s vegetable garden. Since it’s in the NCA you have to be accompanied by a guide (ours was Elle) who tells you about the plants along the way and any wildlife you might see. We were there late and had to get our before the animals came out of the woods, but there are gorgeous views looking back to Karatu all along the trail upwards. We were all meeting for pizza and drinks at Frank and Susan’s that night as a farewell to us and other volunteers that would be leaving shortly. It’s always great to relax together and share experiences and hear Frank’s stories. I suspect most of them are true 😉 Everyone had planned to go out dancing that night afterwards, but everyone seemed exhausted and some of us were leaving for the crater very early in the morning. The second site for our mobile clinics has been Upper Kitete. It is a village almost twice as far as Kambi ya Simba and near the end of the road on the rift. The region is made up of beautiful farmland and borders with Maasai-land – a region that stretches from Ngorongoro north through the Lake Natron region, Loliondo and across the Kenya border into the Masai Mara. Cattle are grazed throughout the region and herded to markets that are held in small towns and big alike. The market in Arusha is a five day trip from this region. The drive to Upper Kitete is obviously much longer and though it is probably just as bumpy, being twice as long makes it seem worse. We have the same crew together, now including Payal again, and Natalie, a pediatric nurse volunteer who decided to come along to help as well as to see what we were up to. We had ordered lunch boxes for the volunteers, but unfortunately Nixon, who runs the Lilac, was up until 1 a.m. watching a soccer match (his team won the match, but didn’t score enough goals to advance in the playoffs) and had forgotten to have them made. That meant samosas, kitumboa and chapati again for lunch. There were a fair number of patients waiting for us at Upper Kitete as we drove up to the dispensary. 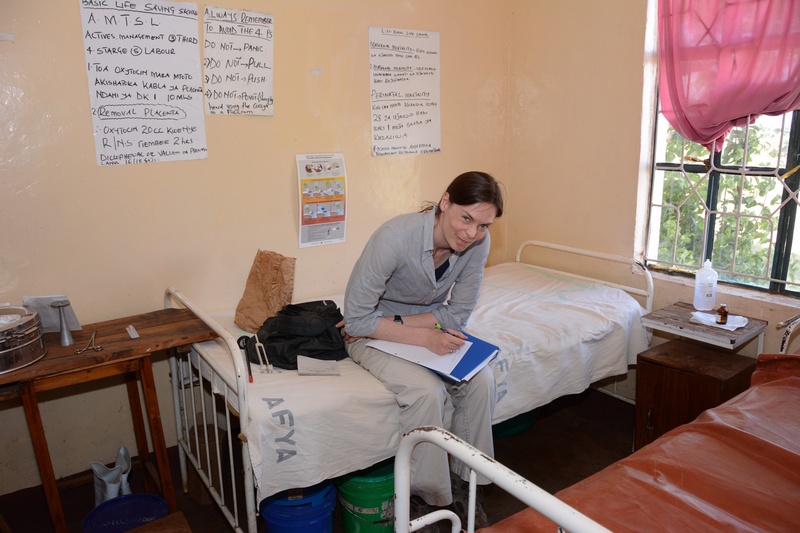 The accommodations are far less comfortable there than at Kambi ya Simba and we have more patients on average. The two rooms we work out of include the nurse’s office, that has an opening in the ceiling with a colony of bats up in the attic that are constantly squeaking while we’re seeing patients and the room smells of bat urine, and a second room which is the labor and delivery room and has only two beds separated by about 1-1/2 feet with no other room to spare. 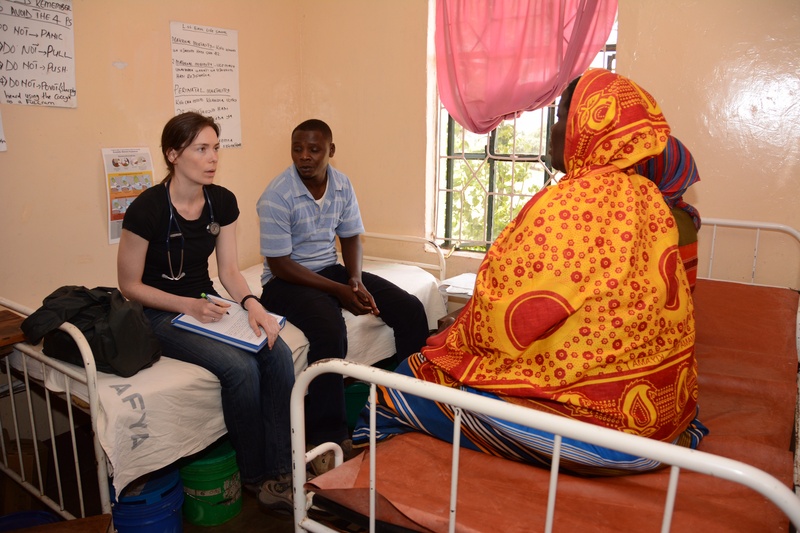 In that room, the doctor and interpreter sit on one bed while the patient and family member sit on the other bed. They are quite suboptimal, but we’ve always gotten the job done one way or another. After finding some chairs to use in the rooms and screening the first patients to see we were off and running. We have to screen patients who come to make sure they have neurologic issues and not other complaints. Sometimes the community hears that we’re neurologists and other times they just hear the word specialist and think that we can deal with any problem under the sun. 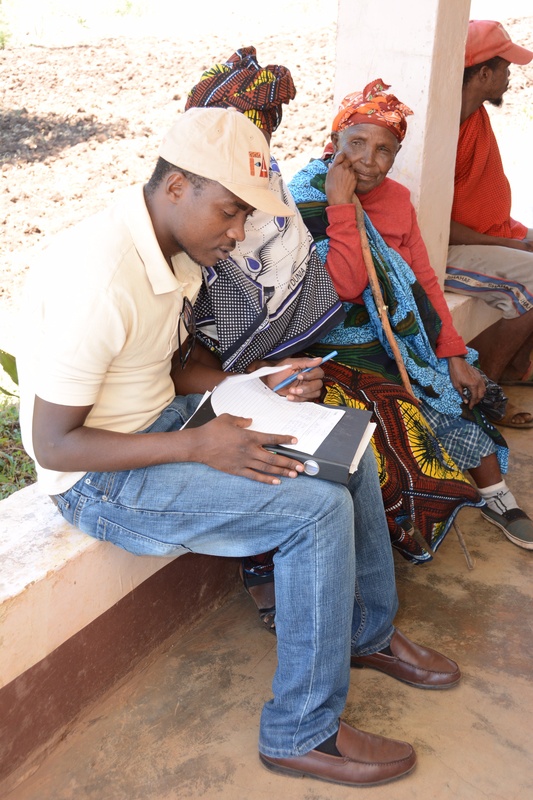 Not only is it true that we only wish to deal with neurological problems, but the other issue is that there is a government clinical officer available in the village and we should not be providing general medical care. Our patients varied from migraine headaches, back pain, neuropathy and perhaps the most disabling of all, epilepsy. 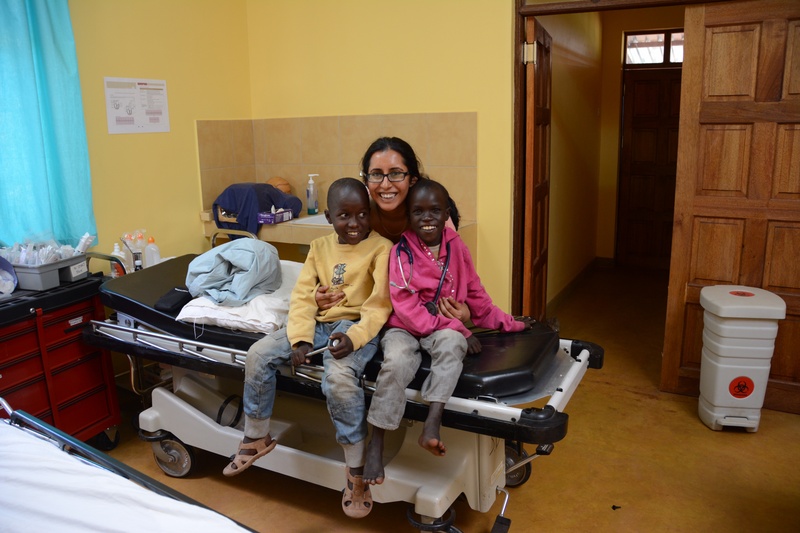 We had a number of pediatric patients for Payal and plenty of adult patients for Christyn. We also planned to bring some sugar and tea as well as some canga cloth to the widow of a patient who I had cared for over the last three years with Parkinson’s Disease and who passed away a few weeks ago. This is the tradition here and something I felt we should do having known the family for several years and the last visit or two were house calls as they live essentially across the road from the dispensary where we’re working. At the end of our first day of clinic we drove out to the overlook. This is a small spot that sits at the edge of the Great Rift and looks over the Rift Valley for many miles to the north and south and is a breathtaking view. There is small road that goes through an historic socialist village from the early days of Tanzania after the independence and leads out to the overlook, where there a few homes. I suspect the occupants are unaware that they have perhaps one of the more spectacular views in the world right outside their doors. We always joked that this would be an amazing location for a resort and even an infinite pool, but then it wouldn’t be Tanzania. I think I like having this place all to ourselves and just the way it is. Day 2 at Upper Kitete was more exciting for a few reasons. No, the bats didn’t decide to leave, but for one it was well baby checkup day with the nurse so the dispensary was overflowing with the cutest little babies and their mothers. Considering we had a pediatric neurologist and a pediatric nurse with us it was an opportunity that didn’t go to waste. Each baby was being weighed in its own home made harness that each mother proudly put their baby into. We were able to use the nurses office for a little while, but then she needed it for immunizations and we were down to one exam room. During this time, we were called out from for someone who was having a seizure. 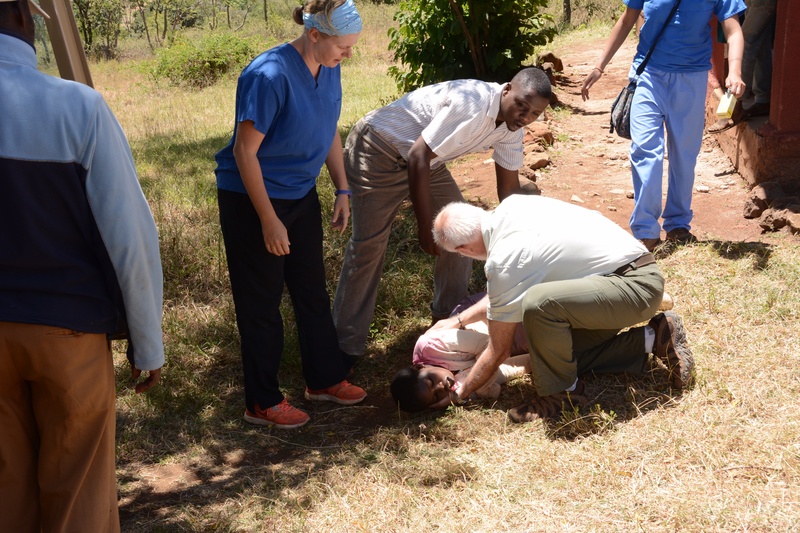 A young woman was on the ground having a generalized convulsion and her sister was keeping her sitting up. We quickly laid her down on her side and protected her head while Payal ran to grab some valium to give her rectally if she didn’t stop. It only last a minute or so and then she was postictal. Since we only had the one room, Sokoine carried her into Christyn’s exam room while she was finishing up a patient and we laid her on the bed. Christyn apologized to her patient and then just continued on with her patient. The seizure girl eventually awakened and it turned out that she was a small dose of phenobarb that the family ran out of in January. I don’t recall what we started her on, but it was one of our better medications for her and hopefully her seizures will slow down. Payal later saw a young boy (clearly delayed) who was having frequent episodes of very brief alterations in consciousness associated with brief posturing of his arms and head turning that were clearly ictal events. He had not been treated for these episodes previously and she put him on levetiracetam that I had brought with us this trip and glad I did since we have used it so often. We went to the widows house as we were leaving town, but unfortunately she wasn’t home so let left our gifts with her sons. Then we went to the overlook again and this time climbed the small hill that’s adjacent and had an even better view than we did the day before. It’s just such an amazing country both based on it’s geography as well as its people here. 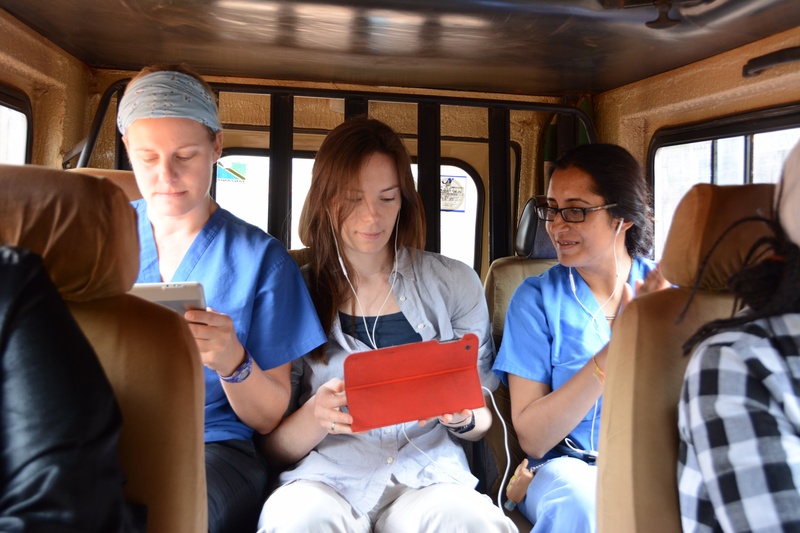 We always have so much fun on mobile clinics as we spend the four days together as a team and with a great purpose. We arrived home long after clinic had closed and caught up on emails since Upper Kitete is off the grid for cell service. A quiet night of dinner and catching up on things. The day started rather uneventfully, but quickly escalated into more a typical day here. Payal had gone to the ward to evaluate Grace, the young patient with leukemia, and found that her headache was worse. Given her leukopenic state on chemotherapy she was a set up for an opportunistic infection or worsening of her leukemia as an explanation for her headache. 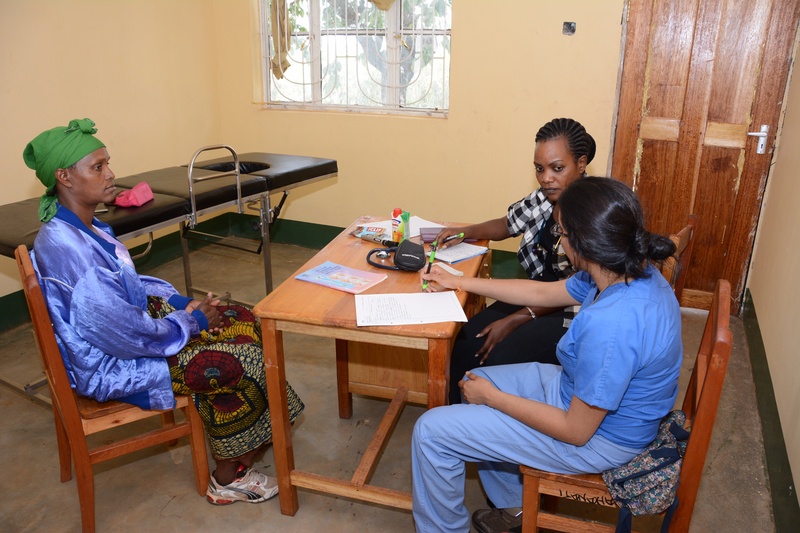 Payal spoke with the patient’s oncologist at Muhimbili University in Dar and they agreed that she needed an LP as soon as possible and that we couldn’t do it here. She needed to transported to Dar so we contacted Flying Doctors to hopefully arrange a flight if they had a plane available. The cost was still an issue hence my plea for donations in an earlier blog. There was also another young child in the ward who had been very sick with sepsis and an altered mental status as well as a history for epilepsy and concern about non-convulsive status epilepticus. 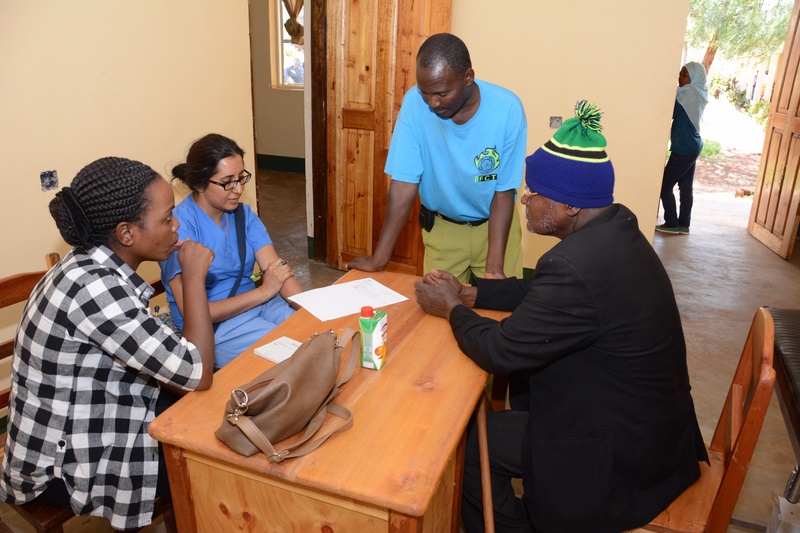 Between young Grace and the other patient, Payal didn’t feel comfortable leaving FAME for our second day of mobile clinic and we all decided that she could stay here to tend to the two patients and Christyn and I would go an tackle Kambi ya Simba for the second day. Prior to our leaving for clinic, arrangements were made to fly Grace to Dar and Payal would help take her down to the Manyara Airpot about 20 minutes away. I told Payal not to let them take her to Dar with Grace as it was likely she’d get stuck in Dar overnight and we needed her for clinic the following day. Sure enough, I heard later that Payal almost ended up accompanying Grace, but instead Hannah went on the flight. It was a very small plane and quite windy so it wasn’t a nice flight and, as predicted, Hannah ended up spending the night in Dar and didn’t eventually get back to FAME until the 2:30 p.m. the following day. Meanwhile, it was quite slow at Kambi ya Simba, Christyn and I evaluated a six month old child with increasing head circumference and abnormal eye movements. Not a very good sign and quite concerning. He had been born at full term following a normal pregnancy and the family had noticed that the child’s head was beginning to increase in circumference at about one month of age, but hadn’t taken him anywhere to be evaluated yet. He was still feeding normally, but as the head grew his eye movements were becoming abnormal. 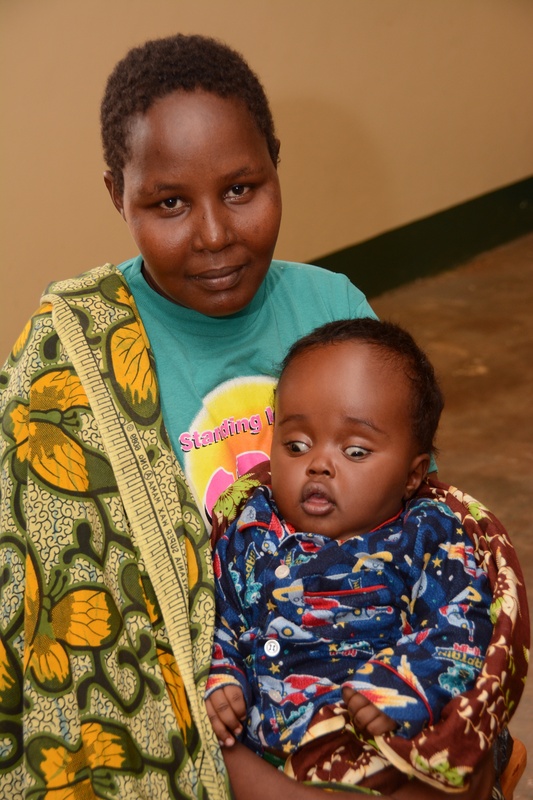 The child’s head was far too large for him to hold it up now and he had a bulging fontanelle as well as abnormal eye movements suggesting that he had increased intracranial pressure and was in rather desperate need of a VP shunt. 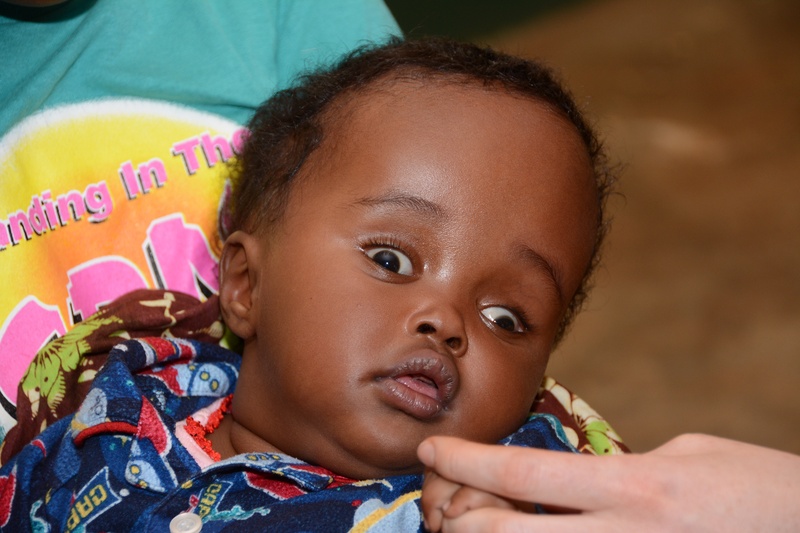 Luckily, there is a funded program in Arusha (Pediatric Surgery Neuro Project) that we could refer him to. 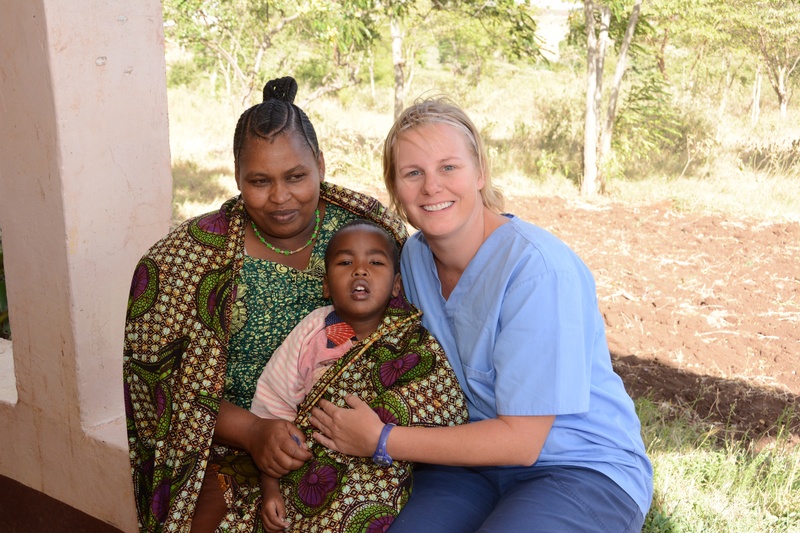 That would cover the cost of the surgery, but they would need to have money not only to travel to Arusha, but also for them to stay there for at least a week. William is the one who arranges for these matters and we were able to come up with around 100,000 TSh (about $67 USD) that would cover the cost for them and we urged mom to take the child the following day. It’s very difficult to get follow up often, but I’m sure that William will check back on them shortly. 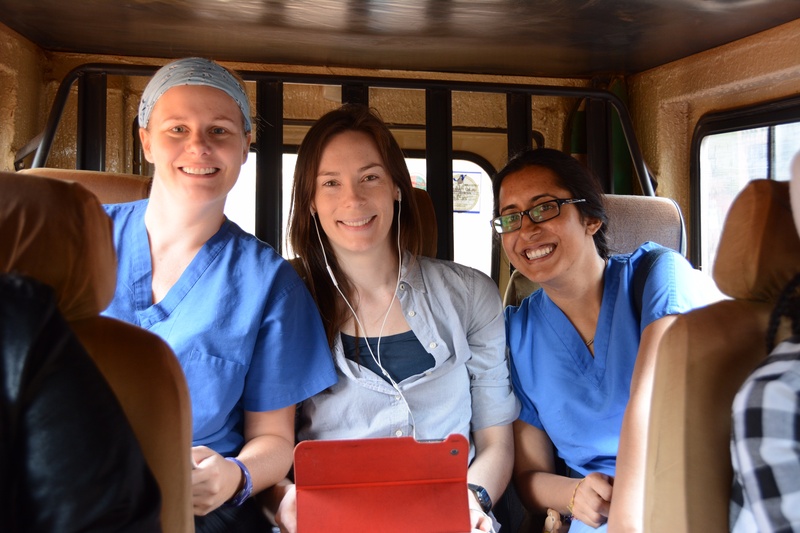 We returned from Kambi ya Simba early this day and got back to clinic in time for us to some other work and catch up with Payal on Grace’s story as well as another patient on the ward that she was seeing. We had planned to all go out to a local bar that night for barbecued chicken and chips (fries). The bar is called “Carnivore” so it obviously something that didn’t appeal to Payal so she spent the night in. There was a large group of volunteers, nurses and doctors from FAME there that night and it was great to spend time out together. I can’t comment enough on the closeness of the FAME staff including the volunteers, but it’s not surprising given the amazing warmth of the Tanzanians and their always welcoming nature. It’s why I keep coming back over and over again. Monday morning was the beginning of a four day stretch of mobile clinics. For those of you who have not read my previous emails or blogs, the mobile clinics we do are in the villages of the Karatu district in a region called Mbulumbulu. 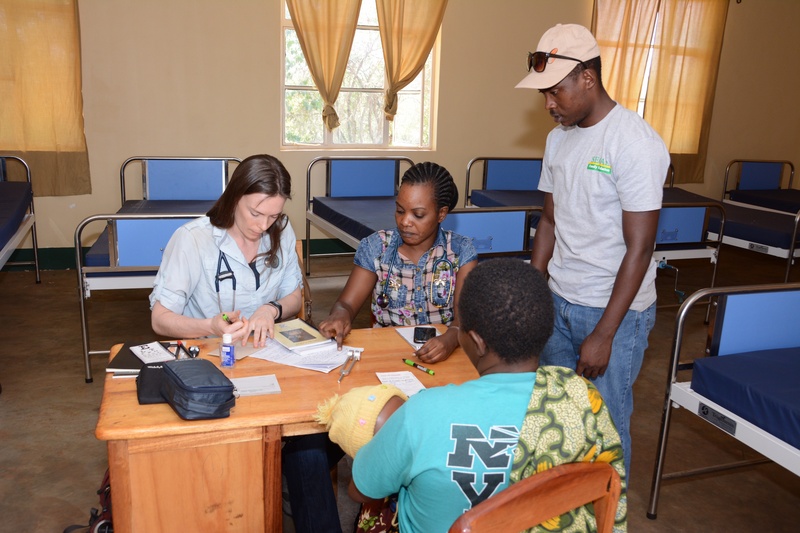 FAME had been doing a large funded mobile clinic every month to the Lake Eyasi region of Tanzania which was a five day long adventure and living in a very primitive conditions while providing general health care to areas that had none. 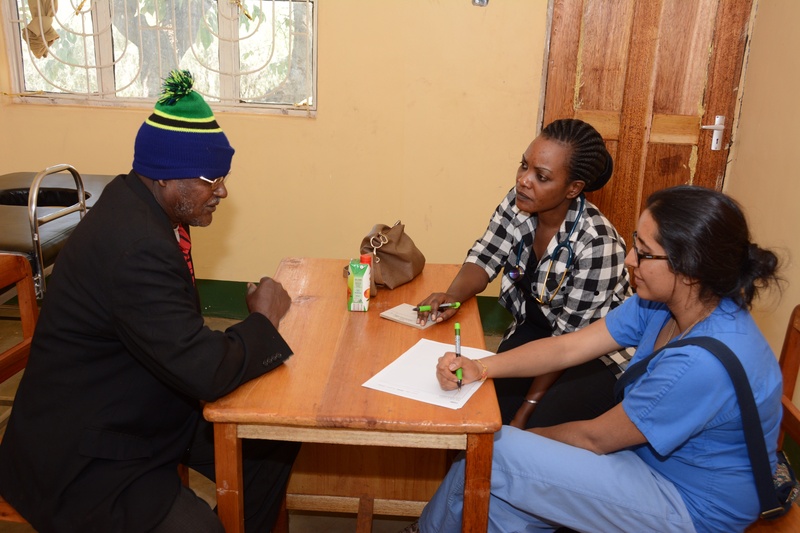 I had gone on three of these clinics during my time at FAME and realized that we could do a smaller scale specialty clinic to villages not too far away so that we could return home each night. We started the neurology “mini mobile clinic” in April 2011 and have been doing them every six months since then. 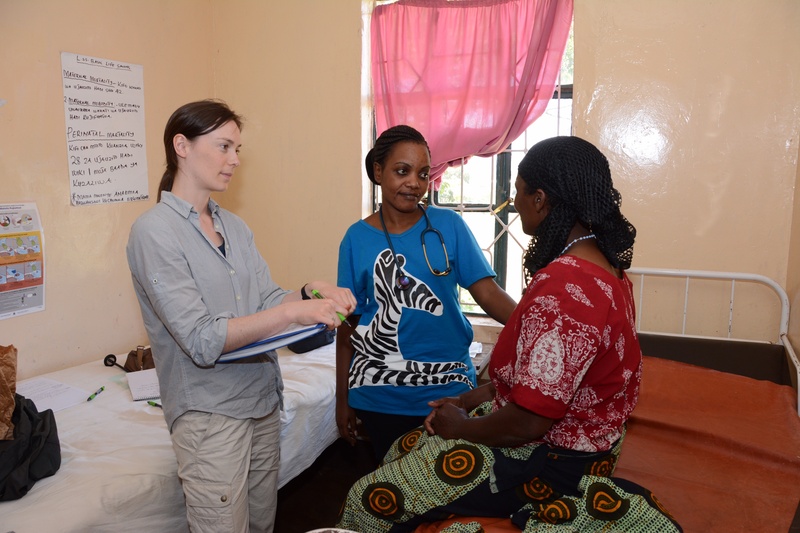 The larger mobile clinic ended when its three year grant was over sometime in late 2012 or early 2013. We have traveling to two villages in the Mbulumbulu regions, Kambi ya Simba and more distant, Upper Kitete. This region is out along the rift in an area that is not traveled to by any tourists and very few Westerners. It takes about an hour to get to Kambi ya Simba so it is necessary to get a reasonably early start. Sometimes that is easier said than done, though, as there are many parts of this operation that are often difficult to sync. It’s also important that we have all our supplies packed as it is not possible to drive back during the clinic or have someone else come bring something that was forgotten. We finally rounded up all the troops and I think we were probably on the road out of the FAME compound around 10 a.m. Very little here is as simple as it seems, though, and after hitting town we had to first stop at the Mushroom Cafe to get our lunch that consisted of beef samosas, kitumbowa (spelled phonetically here but are little sweet, greasy rice cakes), and chapati with peanut butter and banana for Payal as she’s a vegetarian. Then we stopped at another shop for all our drinks and water for the day. I think we ended up making one or two other stops and were finally heading out of town after a little over 30 minutes. The road to Kambi ya Simba is incredibly bumpy and equally as dusty. This was supposed to be the rainy season, but as I explained earlier in the blog, the monsoon rains have yet to come. The land here is amazingly fertile and green everywhere. The soil is a rich volcanic mixture and most of the land is well utilized for farms. The requisite cattle and goats are being herded along the roads often by children who seem like they only recently began to walk. 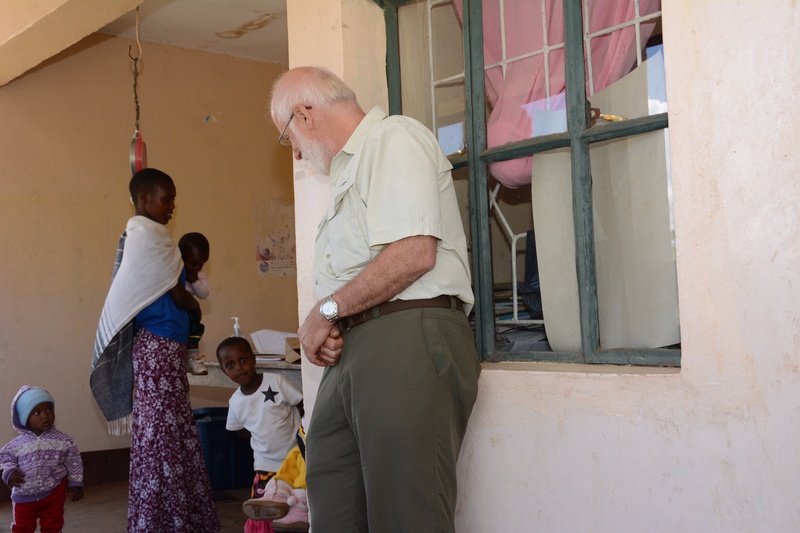 We arrived at Kambi ya Simba around 11:30 or so and began seeing patients shortly thereafter. 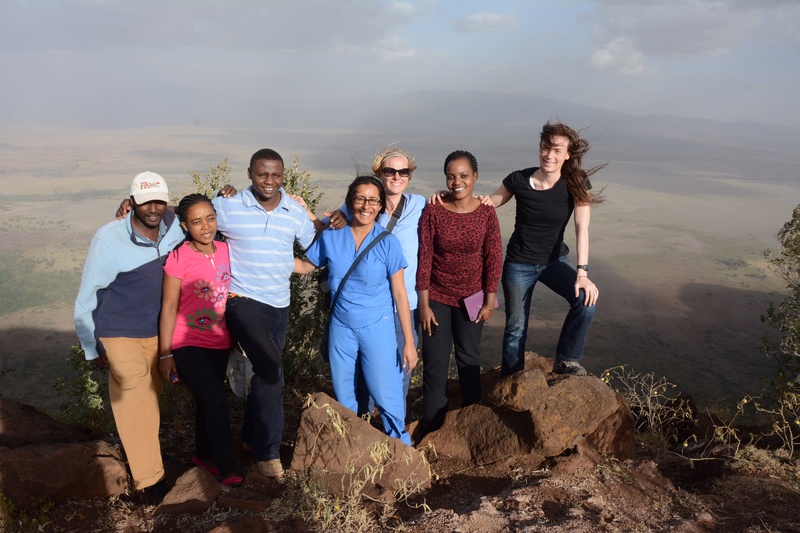 The “crew” consists or William, our outreach coordinator, Dr. Anne, our clinical officer, Sokoine, our interpreter (along with Anne), Patricia, our nurse and pharmacist, and Ema, our driver and fundi (expert) in case anything goes wrong along the way. And then there are the three neurologists. Our mobile clinics, as well as our neurology clinics at FAME, are funded, meaning that we charge a very small flat fee that includes the neurology consultation, any labs and any medications prescribed. The charge is 5000 TSh (Tanzania shillings) and the equivalent of less than $3 USD. If someone can’t afford to be seen we reach in our pockets and pay for their visit or it is covered by a general patient fund that the volunteers here are constantly adding to. We keep track of any patients who are seen by the neuro team and the full cost of their care including testing and medication so that we are aware of how much the neuro program is costing. There is little question as to the impact we’ve had here over the last several years with treatment of epilepsy and stroke as well as assessing young cerebral palsy patients who require rehabilitation, but can’t go without a doctor’s referral. 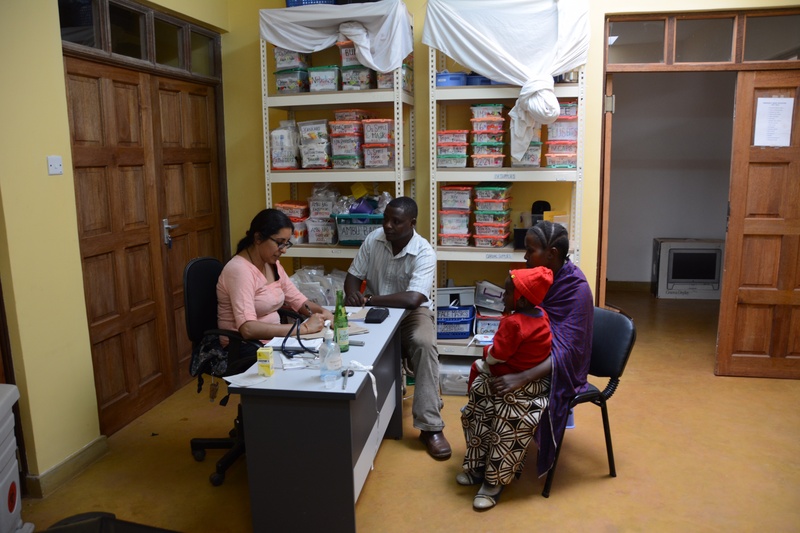 Our clinic at Kambi ya Simba is in a government health center which is a step above a dispensary. They have a clinical officer there and both a labor and delivery ward as well as a postpartum ward. Unfortunately neither of the wards have been used at least in the six months since we were last there, most likely due to a lack of supplies and staffing. Simply providing a building doesn’t insure that it will be used. In any event, we’ve held our clinics in the wards which are quite roomy, though devoid of chairs or desks and only have beds. We had to drag a desk from across in the nurses office along with some chairs. Despite these hardships, it has been a comfortable place to evaluate patients. 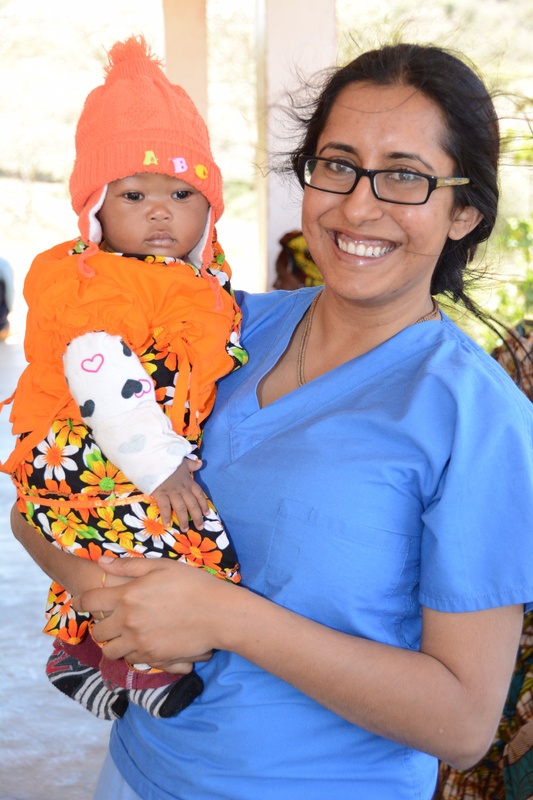 There wasn’t much in the way of pediatrics for Payal that day and we only saw around 15 patients total. Clinic didn’t start until probably close to noon so we didn’t get out until after 4 p.m. which meant we arrived home after the clinic was closed. Christyn and Payal had decided to run and Leonard, my good friend, was up at Gibb’s Farm with a safari group so we were heading there later to say hi. He also hadn’t met Christyn and Payal yet and since they had met the rest of his family and we had stayed at his home I thought it only proper that they meet him as well. Before we left, though, Payal was asked to see a young leukemia patient on the ward who was complaining of a headache. When she was finished we were on our way to visit. We sat up at Gibb’s under an incredible sky full of stars until almost 9 p.m. and then said our goodbyes. We had decided to start our drive very early on our last day and leave just before sunrise. We would be eating breakfast out on the drive rather than in camp and planned to come back after noon for a hot lunch before our departure home. Everyone met at the mess tent at 6 a.m. in preparation for a 6:15 a.m. departure. There was definitely a chill in the air and it had rained slightly overnight which kept the dust down just a bit to be manageable. It was a gorgeous sunrise and the sky remained all pastels it seemed forever. 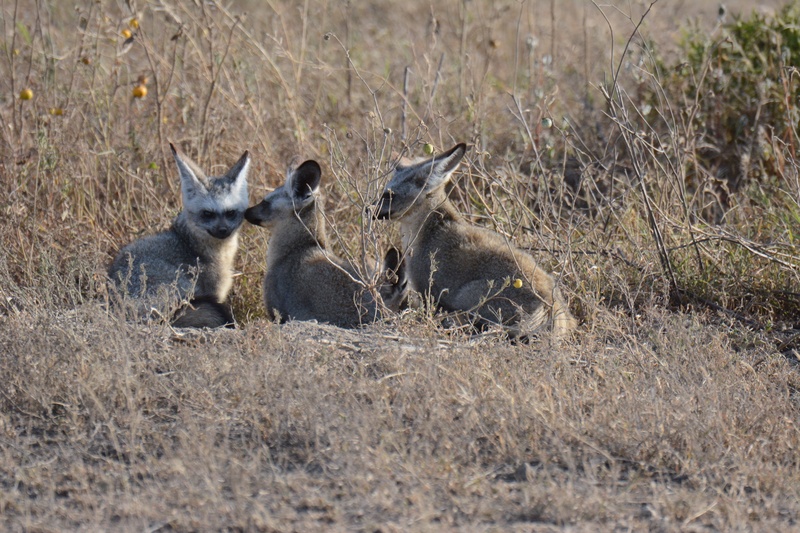 We almost drove by our first sighting, but they were four bat-eared foxes sitting just outside of their den and alongside the road. They are nocturnal animals and the only time to really catch them is either right before sunrise or immediately after. They are extremely shy animals and incredibly cute. 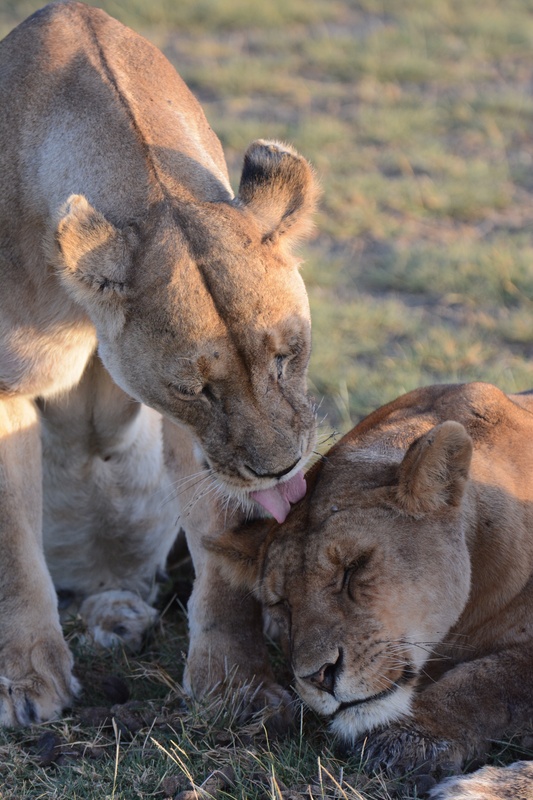 We drove back to the Big Marsh to look for the lion pride and ran across four females all lying together and just waking up from their naps. They didn’t look like they had eaten anything over night so we decided to watch them for a while to see what they were up to. Shortly thereafter, the four got up and looked as though they were on the prowl for something. As they traveled up and over a nearby ridge we followed them into another marshy area where they again decided to take a break and lounge a bit. We watched them from afar while several other vehicles came into the area to watch “our” lions as well. 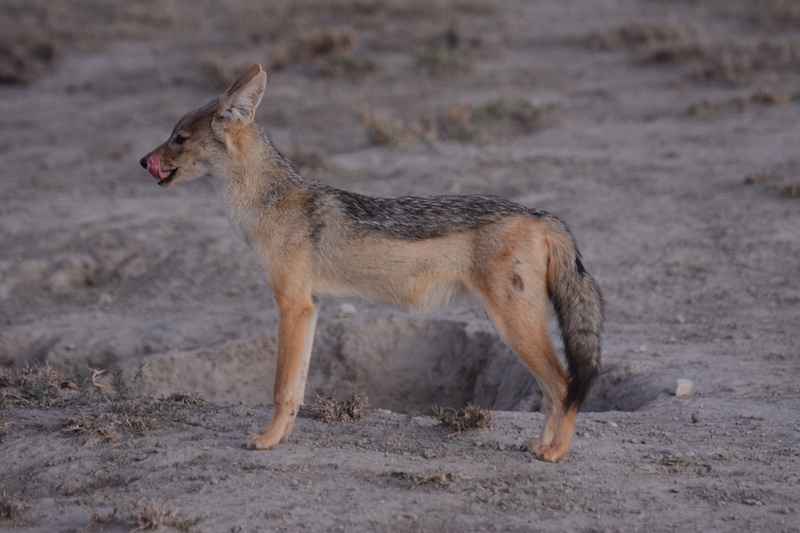 A lonely jackal was following them which is a good sign as they often scavenge off of lion kills. 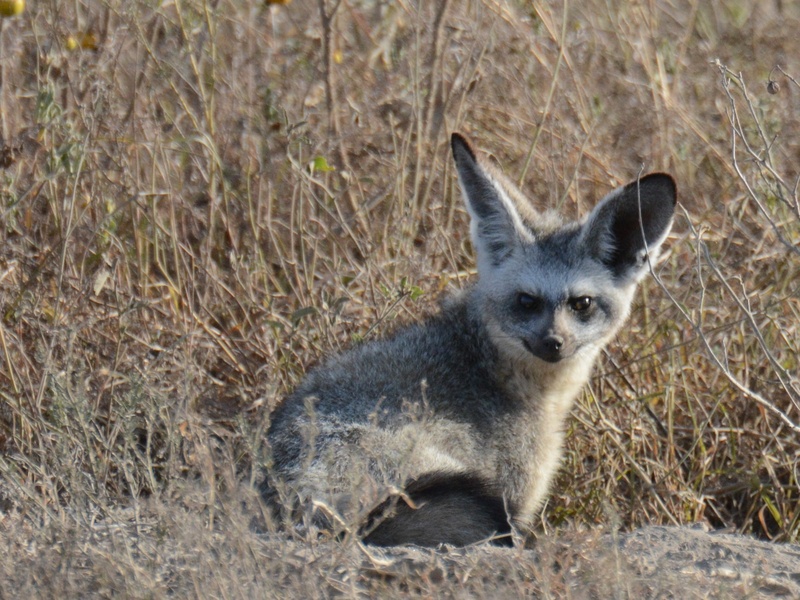 At one point we thought one of the baby cheetahs from the other night was near the jackal only to realize that it was an african wild cat. One of the other safari vehicles took off after the cat, but Isaac had spotted an adult cheetah up on the ridge and we decided to take a look. Though cheetahs are usually unfazed by vehicles, this one was on the move and most likely due to the presence of the lions as they are mortal enemies and the lions would jump at the opportunity to kill the cheetah without a thought. We followed her for a bit and then went back to the lions who were still just lying around. We decided to travel a ways onto one of the ridges in between the marshy areas so we could eat our breakfast that had been packed for us. It was so amazing sitting out of the vehicle (in a very safe area that Isaac made sure of) and drinking our coffee and chai with our breakfast. It was definitely a highlight. Hannah decided to climb one of the trees nearby even though she hadn’t done it since she was a child and luckily didn’t manage to hurt herself, though if she had there would have been plenty of help given all the nurses and doctors on site. After our breakfast and checking the lions once more we decided to take a long drive to some distant areas from the marsh. 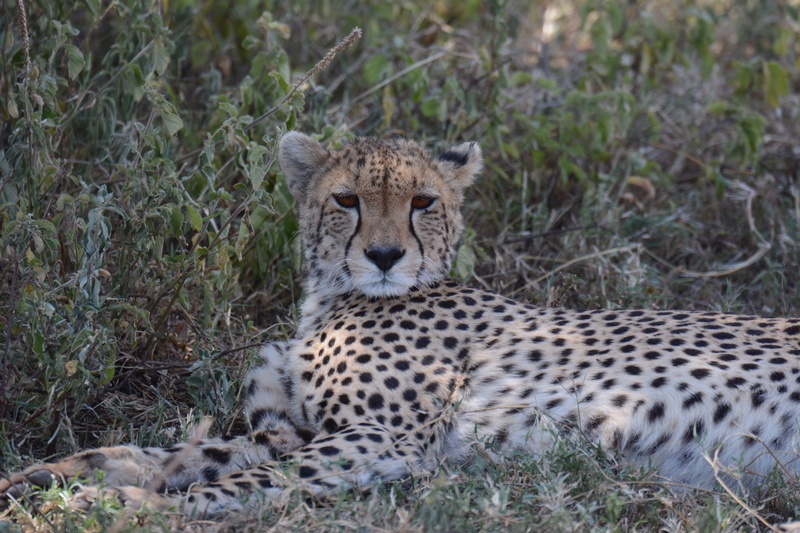 We did run across another cheetah relaxing in the shade, but little else animal-wise. Cheetahs are always on the lookout, both from a standpoint of looking for prey as well as protection. They are very vulnerable to attacks by lions or leopards and so are always seen with their heads up and looking around as opposed to the lions who sleep without a worry on their minds as they are prey to no one. We eventually made it back to our four lionesses who were still relaxing in the shade, but seemed to be positioned expertly to keep an eye on the water hole below. A group of zebra were milling around up above and since it was getting to be around noon we thought there might be a chance they were thirsty and would come down regardless. We sat on the ridge watching the lions and it seemed the zebra had decided to avoid the watering hole. After almost two hours of watching little if any movement by the lions or the zebra we decided to wait another 15 minutes and if nothing happened by then we were going to head back to camp for lunch and call it a day. We had now been watching these same four lions for the last several hours, or since 6:30 a.m. to be exact. It was one of those situations where none of us wanted to give up on the chance of seeing these lions hunting, but we also had a time limit as we had to be driving through the gate at Ngorongoro by 6:30 p.m. otherwise they lock the gate and we’d have to spend the night on the crater rim – not a good idea at all as we all had to be at work the following morning and there would be no place to stay on the rim. We were sitting on top of a rim overlooking the watering hole down below with four sleeping lions spread out at various locations and it was not looking as though there was going to be any action. We had given it our 15 more minutes and just about when we were going to give up we saw the zebra in the distance coming down to the watering hole totally unaware of the lions. As the zebra slowly worked their way down to the water it became readily apparent that the lions were strategically positioned so that they could cut off any escape by the zebra. The only problem was that only one of the lions was aware of the zebra and the other three were still dozing. The zebra moved into position and the lion waited for them to begin drinking before she made a move. It was a small group of perhaps eight adults and a baby. It was clear that she was getting ready to pounce and the zebra, though always wary and skittish, were oblivious to impending attack. It seemed like forever, but then it happened. The one lion sprung up from her hiding place and shot down the hillside straight at the zebra who quickly realized what was happening. The zebra began to scatter and it was several moments before the other lions realized the attack was on, but once they did they were immediately involved. The zebra were running up the hillside in between the lions and it looked as though they might catch one of the adults when we suddenly realized that the lone baby was lagging behind the adults and stumbling as it tried to get up the hill. It happened so suddenly, but the baby was in the grasp of one of the lions who had it by the throat and the other three were there in a flash. 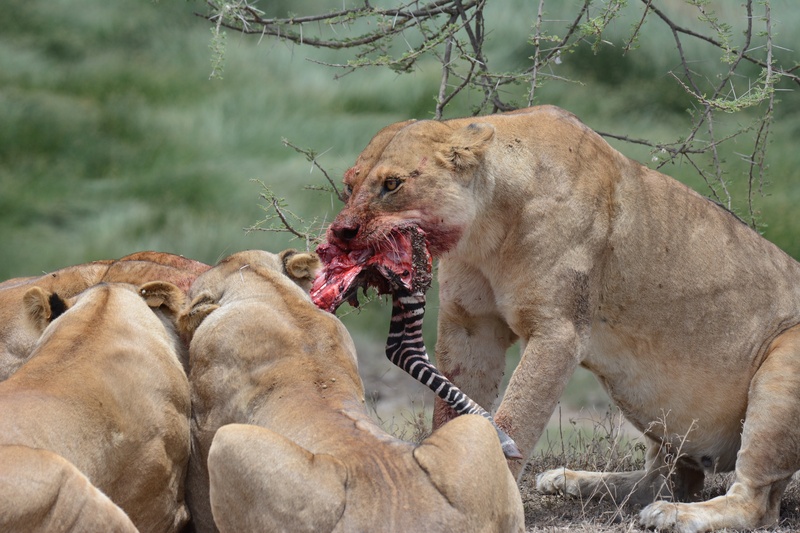 Within a moment, the baby was dead and the four lions were devouring it with lots of growling and fighting. We were the only ones to have witnessed this event and we had watched these lions for almost six hours. 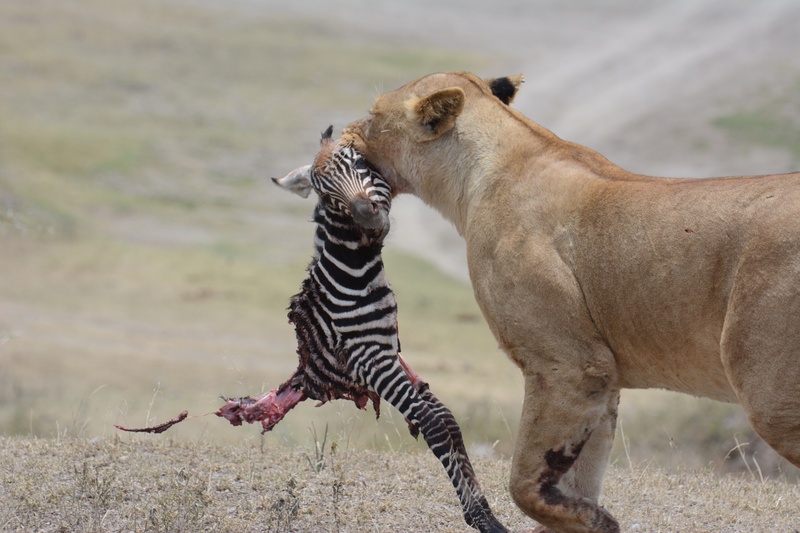 We sat, perhaps only twenty feet from this scene as the lions finished off the baby zebra with lots of commotion and disagreement, as two other vehicles eventually came by to share. It was sad that the baby was the one to have been killed, but we were comforted in the knowledge that regardless of our presence, the baby would have been lost either way. 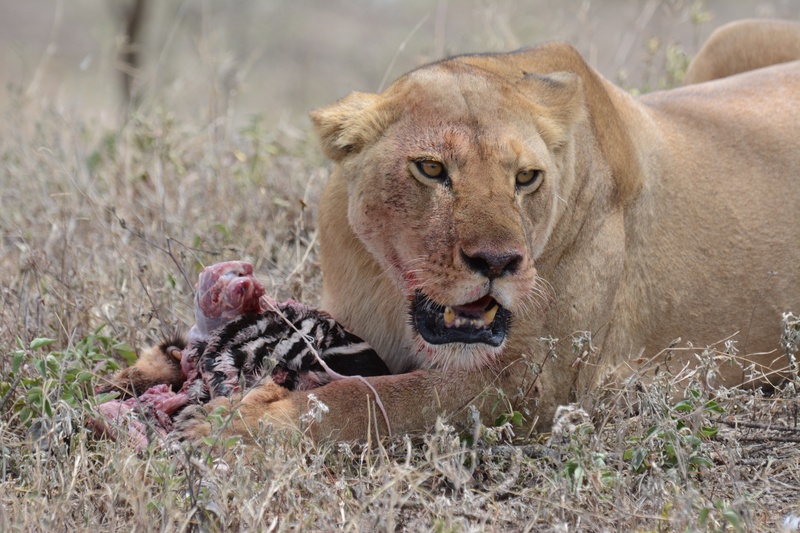 All the other zebra sat up above us and were crying for the baby – I had seen this in the Serengeti last September after we arrived just following another baby zebra kill. It sounds so cliché, but it truly is the circle of life and you quickly realize that this is nature in all its beauty and all its tragedy. Witnessing a lion kill is not a common event on safari and many people have come for several years without seeing one. I had also witnessed a cheetah kill in 2012 and these events are by far the most powerful thing one can can participate in here in Africa. They are intense and emotion filled and something that will never be forgotten by anyone who has witnessed them. 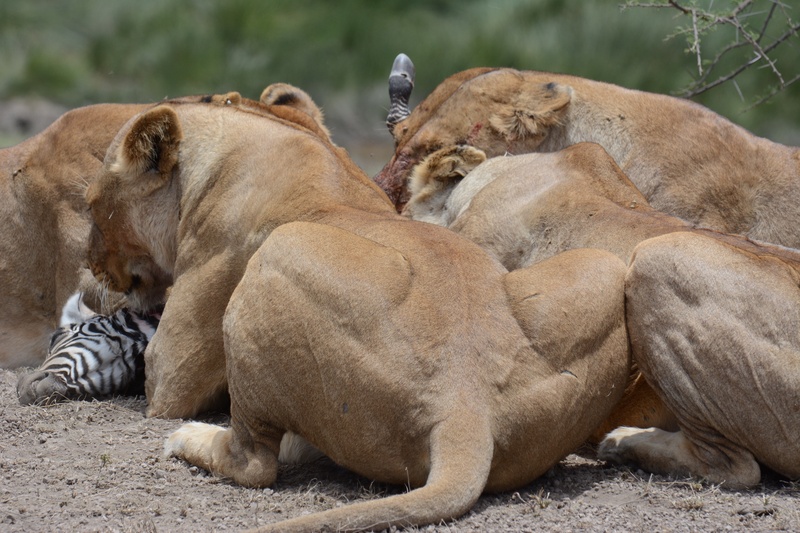 We watched the lions for some time afterwards as they finished off their prey and eventually drove back to camp for lunch. It was such an amazing morning for so many reasons and I think we were all still processing what we had witnessed. Lunch was delicious, of course, and we packed up and piled into our vehicle for the long drive home, back up over the crater rim and down into Karatu. We made it to the gate at 6 p.m. with only half an hour to spare. It would have been a cold and lonely night had we not made it. We were all exhausted and spent the evening relaxing. I didn’t eat dinner and got up starving the next morning. Our last day at Ndutu was a monumental one.